Using a mortar and pestle (or food processor), mash the garlic, bay leaf, paprika, salt, chili peppers, black pepper and olive oil into a paste. Put the paste mixture into a large ziploc bag. Add chicken wings to the bag, seal the bag and rub the paste all over the wings. Refrigerate for several hours or over night. 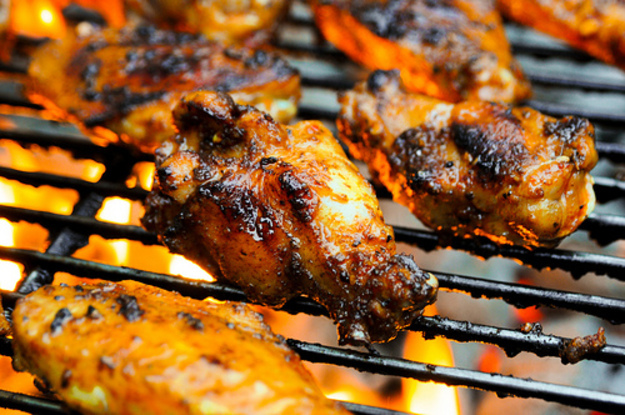 Remove the chicken wings from the refrigerator and let stand at room temperature while preparing the grill. Grill the wings over high heat until skin is crisp and the chicken is cooked through, about 3-5 minutes per side. Serve immediately.